Presidentress: Win an Autographed Copy of "Hottest Heads of State"! 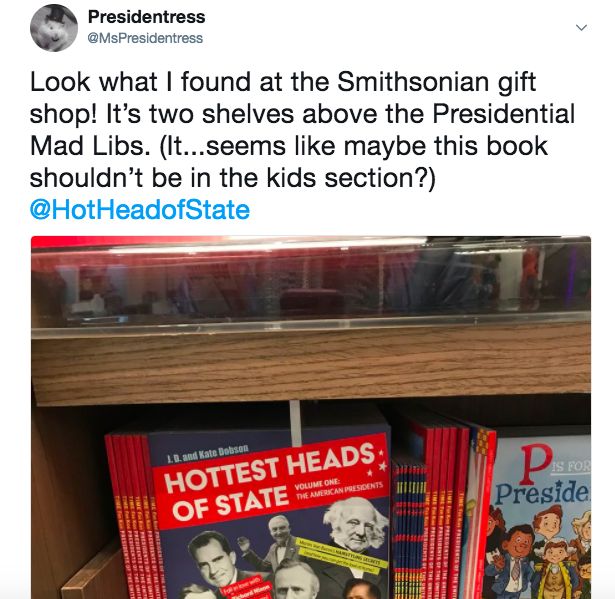 I'm pleased to announce that I have a copy of Hottest Heads of State to give away to one lucky winner---and it's autographed by the authors, J.D. and Kate Dobson! There are several ways to enter, as outlined below. If you don't want to take your chances on winning a book for free, you can pay money for one right now on Amazon. Again, not judging. 1. This contest is open to humans age 18 or older who have a U.S. mailing address. 2. Members of my household and my immediate family are ineligible. 3. My cousin Christina is also ineligible because I already gave her a copy and she's not going to get another one out of me. 4. The contest runs from 12 a.m. Eastern April 4, 2018, to 12 a.m. Eastern April 11, 2018. 5. A winner will be chosen at random within 72 hours of the end of the contest and will be contacted based on information provided when entering. If the winner does not respond within 7 days, a new winner will be chosen. 6. The book will be mailed via USPS within a week of my receiving the winner's address. The book will probably be sent media class---it depends on how much postage is. Maybe the winner will luck out and I'll send it Priority. 7. I'm not responsible for the prize once it leaves my possession. 8. This contest is void where prohibited by law. No purchase necessary. Always wear sunscreen. 9. This autographed copy of Hottest Heads of State was provided to me by the authors for the purpose of this giveaway. I have not received compensation to run this giveaway or for my review.